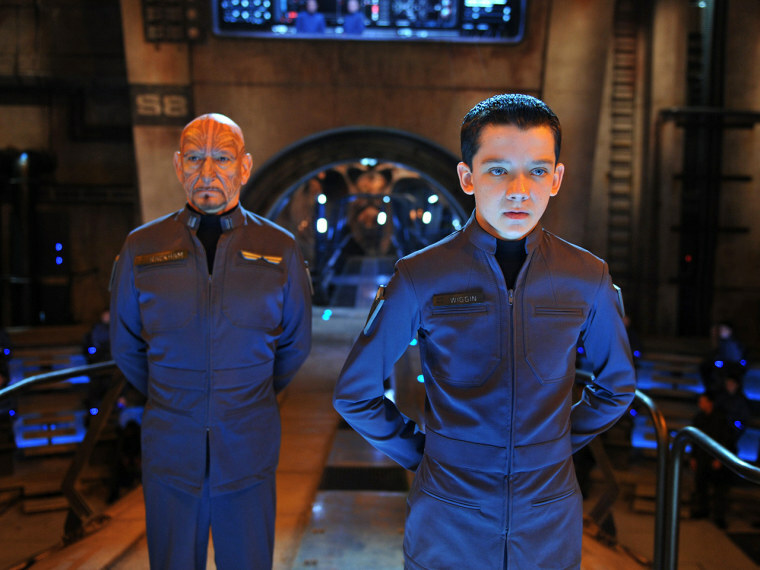 "Ender's Game" opens this weekend, taking viewers on a trip to a future in which gifted children are trained for space battle against an alien race. Rubbing shoulders with Harrison Ford, Ben Kingsley and other Hollywood royalty is a four-armed robot, one that's usually more at home in a lab than on a movie set. The bot, Raven II, makes a cameo about 58 minutes into this screen adaptation of Orson Scott Card's book, playing the role of a telerobotic brain surgeon operating on a child on a space station. "Despite filming from 8 a.m. to 10 p.m., it [got] less than 12 seconds on screen," said Hawkeye King, a graduate student at the University of Washington, and one of the two roboticists who operated the robot from off set during filming. In its day job, the Raven II doesn't slice into people. The bot is a test system on which engineers can dry-run new techniques, tools or software for future remotely controlled laparoscopic robots. "We spent the week dressing it up," King told NBC News. He and a colleague, Lee White (now a medical student at Stanford University), travelled with Raven II to New Orleans for the shoot in the spring of 2012. To get the bot ready for the big screen, they pasted silver tape over the motors and wrapped the usual mess of cabling in black duct tape. The movie's props manager brought some blue LEDs, and those went on too, King said. "Because in the future everything glows blue, right?" Per the robot's back story, human controllers direct the robot's movements remotely — in the "Ender's Game" scene, the child actor with the head wound on the operating table, is the only human in the surgical theatre. King and White spent hours practicing the moves for the "surgery," he said. Though robotic space surgeons may seem like science fiction, researchers on earth are working towards that reality. Robots, including the famous DaVinci and even Raven II's predecessor, Raven I, are involved in preliminary testing that may one day allow robots to perform delicate operations — on machines and humans — in space. For example, a group in Johns Hopkins University is working with NASA to build a version of the DaVinci system that engineers on earth can control to make precise fixes to instruments in space. Raven I was a member of NASA's NEEMO 12 mission, where it spent two weeks in Aquarius, the underwater lab and test chamber for extreme environment training and research. Raven was installed in position at the underwater lab off the coast of Florida, but it was operated by researchers at the University of Washington. Today, time lags present a key challenge for engineers designing space robots that can be controlled from earth, enough so that they are "noticeable and can degrade performance," King said. Of course, Hollywood tends to find ways around engineering challenges: "In this fictional world they had this instantaneous fast-as-light system." Well, isn't that's convenient.